When I finally decided I was going to give this farming thing a go, I had to make sure I knew what I was doing before I told anyone about my plans. Unfortunately, Craigslist doesn’t have a lot of agricultural job postings. So I went into my search for “organic farming jobs” more than a little skeptically. All I knew was that a dear friend of mine from my days at the Collegian had said her friends were heading off to travel and do farm work – and I thought the program started with a W.
As it turn out, I would of course stumble upon WWOOF pretty early in this quest – though not as soon as PASA. The Pennsylvania Association for Sustainable Agriculture offers a number of services for members and folks interested in sustainable and organic farming, which includes job postings. And that’s where I found Snipes farm, where I would have my first interview. Snipes Farm was appealing for a slew of reasons. It was local (Bucks County), it was huge, it taught farm-to-school programs and summer camps and, on inspection, it was beautiful. The house that the interns lived in was quaint and beautiful, the growing fields were sprawling and diversified, and Brad, the guy who interviewed me and the young Jersey hippie who was also there for an interview, was passionate and engaging about his work. I was still in the early throes of guilt about sneaking away on the weekends to potentially leave my job, but as we fed the chickens and tromped across the grounds on that unnaturally warm January day, everything about this trip felt right. I texted my roommate, my references, my sister, Nate. I wanted to be a farmer. And while I didn’t get the position at Snipes – they took a couple on for the season, though had they chosen to single folks as interns, I was told I would have been one of them – I had some reasonable idea of where to search next. I fired another few letters of interest off into the Internet farming abyss and looked briefly into WWOOF – World Wide Opportunities on Organic Farms. This was what my friend on the newspaper had been talking about. WWOOF is wildly popular network which links licensed volunteers with organic farms across the world. Woofing is a great way to travel. You get to live in cool areas on the short term in exchange for labor, and I’ve met a bunch of folks who have done this to great success. But I wanted something a little more stable, somewhere I could stay for awhile and, if possible, something that paid. After all, I was going to have to look Glenn Wagner in the eye and tell him I was leaving my job for this. Something with a cash incentive would ease that pain. Then I found NEWOOF. NEWOOF, or North East Farmers on Organic Farms, is a directory similar to WWOOF, but you don’t pay to be licensed. It’s sponsored by the New England Small Farm Institute and lists regional farm apprenticeship placements. I sent away a few bucks for the 2011 directory and found an amazing world I didn’t know existed – in Pennsylvania and in the surrounding states farmers were transitioning land, plowing with oxen and hiring young interns who wanted to learn how to get back to the earth the right way. And Keith Stewart was one of them. Keith had a comprehensive listing and was engaging and helpful from my first tenuous e-mail. And when I knew I was going to send over an official letter of interest, I ordered his book, which documents his own adventures on his 13-acre vegetable farm. I took another weekend to drive up and spend the day meeting Keith and his wife and learning about the farm, and as we munched away at some mesclun from his high tunnels, I knew this was where I wanted to be. If you haven’t read any previous posts, let’s just say you’ll be hearing more about this farm soon. That being said, I had heard back from a couple other farms in the meantime, and as Keith met with other applicants and geared up to call my references, I headed out to western PA with my mom to meet Carrie Megginson and Dan Earnest at Buckland Farm, a vegetable and hog operation that also operates a bed and breakfast near Raystown Lake, one of my family’s favorite haunts. Dan and Carrie were lovely and welcoming. We met their friends who come to help out with the farm, their most recent Woofer who was in town for a week, and a D.C. chef-turned-farmer who was taking a sabbatical to learn about the origins of food and to help the farm establish some more ties in the restaurant business. These folks were relatively new to the farm scene, but their operation was incredible. 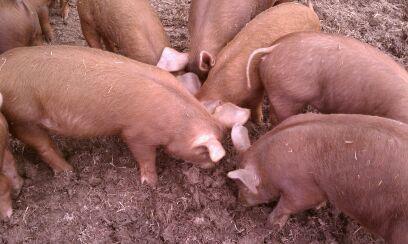 Chickens ran wild near the house and the barn where over a dozen piglets slept in a giant pile under a heat lamp. This season they discussed planting morels and watercress along the stream for foraging crops. Dan took us through fields that grew a wide range of crops, from hops to salsa ingredients, up to the woods where their grown hogs lived, foraged and looked impressive. 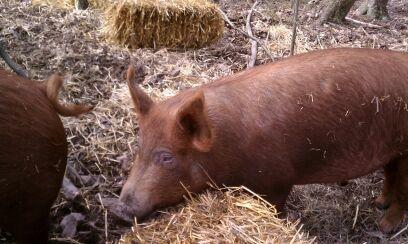 The pigs had cleaned out all the extraneous brush from the woods and were looking chipper and enormous. The cutest little pigs you ever did see. I mean, besides Babe. I stood petting the 850-pound papa pig and, while thoroughly struck by the magnitude of the project, I knew in my heart of hearts I was too much of a wimp to raise some pigs and then eat them later. Maybe that will change in time, but my head’s not there yet. But at the end of the day, I was humbled by Buckland Farm’s hospitality, and hope that I can someday be as diversified, ambitious and, well, cool, as them. 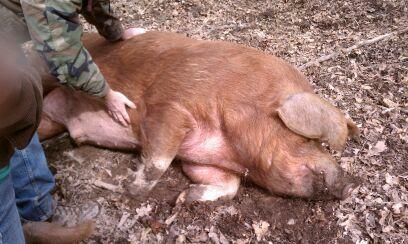 As I watched this 850-pound guy roll over for a belly rub, I knew I couldn't hack it on this farm - at least not yet. I may have to be a vegetarian veggie farmer for life. I was on a weekday vacation with Nate up in the Poconos when my references began to text that Keith had called them. I raced us off to somewhere with actual Internet access and sure enough, there it was – an e-mail saying that he would be delighted to have me on board for the season. And the rest, my friends, is watercress. This entry was posted in Uncategorized and tagged farm intern, NEWOOF, Organic Farming, sustainability, WWOOF by wagnere1. Bookmark the permalink.